Boot Sale Sunday-No bags but vintage designer bargains!! These first two are of the vintage 80s body con Thierry Mugler top I got for only 50p-yes, 50p!! The man wanted a £1, but he couldn't change a £5 note, so I gave him the only coin I had at that time 50p-ha ha!! I also got these DKNY sateen dress skinny trousers for only £1, too! 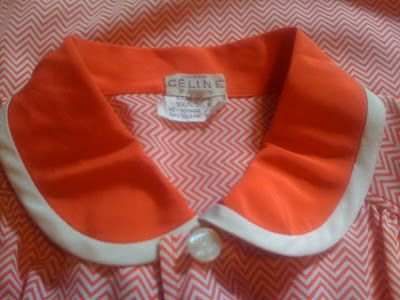 I was also chuffed to see this vintage Celine silk tea dress for- yes, you guessed it-50p!! I must admit, it's not my style, but walking pass this is like walking past Chanel or Hermes for 50p-peanuts, huh!! I do like the dress, but I am wondering whether I would wear it-I'll keep it and see if an occasion does arise!! Then, on talking about sequins in yesterdays post and seeing rice and beans vintage blogspot post on sequins, gave me the inspiration to buy this for £1 too! I could wear this over a top or be daring and wear it with nothing underneath-done up, of course!! I didn't buy just for myself- I also got little Robert an NBA Lakers basketball vest (tank) for £1! UPDATED TO ADD-I'm thinking about cutting the skirt off the Celine dress to leave a blouse-what do you think? Or, I could alter it and make the length shorter-opinions please!! Some really cool finds(its early on a Sunday morn..I put fines first). Isn't that melon or orange sherbert in this year, too. Darling, thank you for you soooo-kind comment. I felt really uneasy wearing those shorts even only in front of my bf. Those are serious bargains! I love that 80s Thierry Mugler top! It is so stylish! That sequin vest is such a piece! Dear, wear it over a sleeveless dress - you can go straight from day to night! I cannot wait to see you in that vest - you will look divine in it! I've never seen anything like that Thierry Mugler top...it's quite cool! 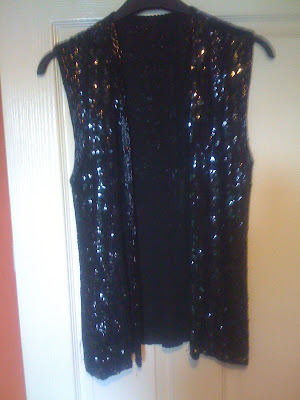 I also LOVE the black sequin vest, I want one! Haha, I know what you mean about passing up brands. I went to a garage sale recently where a lady was selling humongous 80s YSL clip ons and I was actually considering buying them until I thought "I'm never gonna wear these" so I put them back. Have fun with your new finds and sorry for the ridiculously long comment! Hi ellie-thanks and you have a good sunday too!! Hi times of glory-thank you for your lovely comments too!! thats a good tip about the sequin top-thanks! Hi danz-don't apologize for a long post-it's great!! 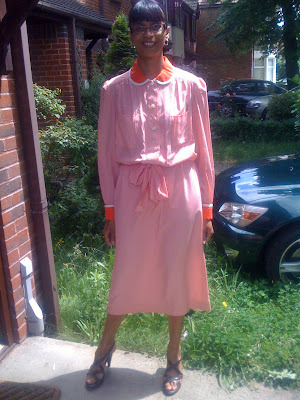 Yes, I was debating about shortening the dress if I keep it-it might even look nice as a blouse perhaps? I would always buy cheap designer clothes or accessories, because you can always sell them on ebay if you change your mind about them! And yes, I would love to trade links. Hi Nay'chelle-thanks so much and I'm adding you now!! i love the one rainbow sleeve! Hi Emma-yes, typical 80s brights!! I don't think you should shorten it either, its perfect at that 40's style tea length!! That's how it should look..
Wow, that Mugler top is so stylish..
Hi ladies who lunch-Thanks for that!! I did think I may be creating sacrilege if I cut this, as I do appreciate a vintage piece-my mind wanders about making it wearable, but deep down I think agree with your thoughts, really! 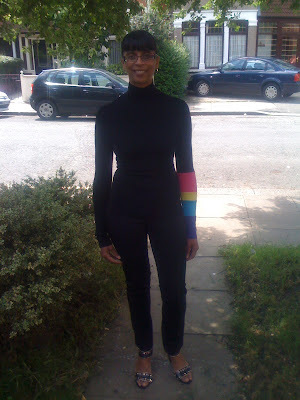 Hi Ladies who Lunch-thanks for your comment on the Mugler top too!! My mum cut a lot of her 70's dresses in the 80's - Ossies, Biba.. she lopped off billowy sleeves and made tops out of them that she never wore.. oh the crime of it!! That shirt you are wearing in the first picture with the multi-colored sleeve is so creative, I really love it. The sparkley vest is perfect for a night out. The sequined vest is wonderful! perhaps you could alter the Celine dress to somewhere above the knee? i think it'd look great that way. . most of the time i see tops and wish they were dresses. Those DKNY sateen pants are HOT..
All in all, it seems like another day of fantastic bargains, dearest Sharon. Happy for you! I really like the "rainbow-top"! a few really good founds! (or finds, im german, sorry^^) i think the dress would look great as a blouse. but be carefull while working.... the shoes u wear in the second pic with the dress are adoreable!!! im impressed, by the way, u got a great and lovely smile in every picture. What great bargains! The 2nd dress is lovely, though I agree it could look nice as a blouse and you may wear it more then! oooo the vest is a dream! I want your Mugler top! Great find! no matter what, that celine piece is amazing, but i would make it a tunic length so that i could either pair it with white leggings and dark brown boots for fall, or espadrilles for summer. Hi Yiqin-so kind again, thanks a lot!! Hi Jen-thanks so much, handy pieces for going out!! Hi alicepleasance-thank you so much!! Hi p-thanks so much for stopping by my blog!! I'm not sure about cutting this, after Ladies who Lunches comments, I do agree really that some pieces shouldn't be altered!! I will pay you a visit and add you too-thanks a lot! Hi fabulously broke-thanks a lot-I'm so pleased thrifting does not break the bank!! Hi Ida-yes, I was certainly channelling different looks yesterday-ha ha!! Thanks so much, dear Ida!! Hi marte-so kind, thanks a lot!! Hi fashionpuppy-you're so lovely, thanks so much-I am rethinking the cutting of the dress, though!! Hi Nic-thanks so much, I think I will keep it as is and see if I do end up wearing it one day!! Hi angie hearts-thanks very much!! Hi soph-yes, very cheap-ha ha!! Hi fashion is poison-yes, I'm pleased with that too!! Hi wendy-I thought you may like that too-thanks very much!! Hi cupcakes and cashmere-thanks so much, but after a rethink I think I shall keeep it in its original state!! praise for your great finds! thank goodness you are not shortening the dress, the length is perfect on you. Hi Karima!! Thanks so much-yes, I think you are right as well, I will leave it as it is!! really love that rainbow sleeve! Hi ash1314-Yes, I'm really pleased with the mugler find!! A lot of debate over the length of the dress-I've decided to leave it as it is, because this adds to the authenticity and original vintage style of the dress. Thanks so much for your opinion! love love love the first look, your rock it! DO NOT cut of the Celine dress, its a beauty!! I would consider tailor it, making it a little shorter, but I really like it. Its such a great piece, so think that through before you decide. Just my humble opinion as a fellow thrifter! Hi Silje-Thanks so, so much for your comment Silje!! Now I have thought, I will leave the dress as it is, as I think this adds to the vintage style and leaves it intact!! I value your advice, Silje! !